Chapters around the nation, primarily in the East Texas Region, have made Brothers Against Drunk Driving a tradition and this year was no different. In an effort to raise awareness about the dangers of drunk driving and risky practices during the Spring Break season, the brothers at Delta Chapter at Texas A&M University, Pi Chapter at the University of Houston, Beta Eta Chapter at the University of Central Oklahoma and at Xi Chapter at the University of Oklahoma encouraged their respective campus communities to engage in safe spring break practices. At Delta Chapter, the chapter set up tabling efforts throughout the week prior to Spring Break and invited Aggies to come learn facts about the dangers of drunk driving as well as the costs associated with infractions related to alcohol such as Driving While Intoxicated, Public Intoxication, and Minor in Possession. The University Police Department of Texas A&M was on hand to answer questions and share their knowledge with the student body. The Delta Knights have hosted Brothers Against Drunk Driving for years now and it is one of the chapter’s spring signature events. During their tabling efforts, the Delta Knights have in the past handed out virgin margaritas, invited their fellow students to walk the line with drunk goggles on, handed out citations with the costs and consequences of DWIs, MIP’s, and PI’s. The chapter has also worked to raise awareness about the dangers of excessive drinking and engaging in risky behaviors during Spring Break celebrations. Meanwhile, at the University of Houston, the Pi Chapter also actively encouraged their classmates to pledge not to drink and drive and to have a safe spring break. The Pi chapter also handed out information regarding the dangers of driving under the influence and asked their fellow Cougars to pledge not to drink and drive and engage in risky behaviors during the break. Finally, the brothers at the Xi Chapter coordinated a Brothers Against Drunk Driving workshop as part of their Philanthropy Week of Spring 2018. 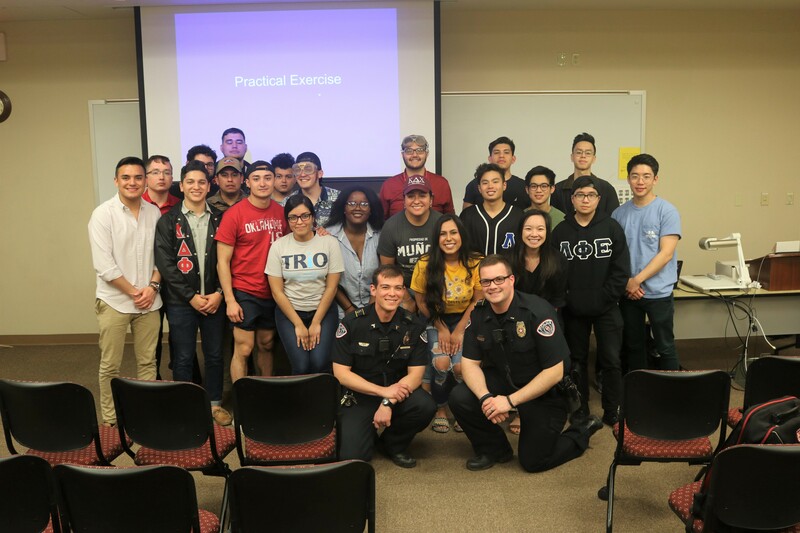 In anticipation of the Spring Break holiday at OU, the Xi Chapter invited the University of Oklahoma Police Department to come present to the campus community about the importance of safe spring break practices and how to avoid risky behaviors. “Officer Matt and Lt. Cody gave a great informative presentation about Driving Under the Influence (DUI) to OU Students” shared Xi Chapter active Jason de Leon. The presentation consisted of safety tips as well as learning about laws pertaining to alcohol, driving, and being under the influence while operating a vehicle or being in a public setting, all crimes and punishable by law. The officers drove their point home and engaged their audience by playing out possible scenarios the students could find themselves in as well as allowing students to walk the line with drunk goggles to see how their vision and ability to function is impaired. Brothers at the Beta Eta chapter at University of Central Oklahoma also partook in educating their campus community through their Broncho Buzz program which was cohosted with the Alcohol Education Center for Counseling and Well Being. The event consisted of a game of Jeopardy and a discussion panel which aimed to bring awareness to the dangers of excessive alcohol consumption as well as the possible consequences. The presentation also aimed to encourage students to make smart and safe choices during Spring Break and encouraging accountability and responsibility during the festivities. The brothers at these respective campuses drove the notion home that fun and spring break don’t have to be synonymous with poor decision making, especially when lives are at stake. Brothers know the importance of defying the stereotypes that plague the Greek system and the collegiate landscape as a whole. Events such as Brothers Against Drunk Driving reinforce the notion that fraternities and sororities and college students altogether can have fun and do it in a safe responsible manner.